"There isn't a page here that doesn't whistle with the sound of wings." "Remarkable....Her demonstration of how deeply human emotional life can become intertwined with a particular landscape could not be more relevant to our lives." 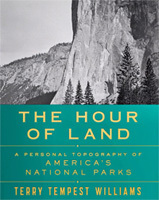 "Profoundly moving...one of the most significant environmental essays of our time." 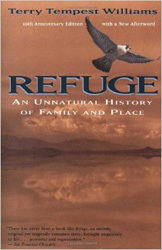 REFUGE was released in a new paperback edition with a special afterword to celebrate the 10th Anniversary Edition in Fall, 2001, by Vintage. 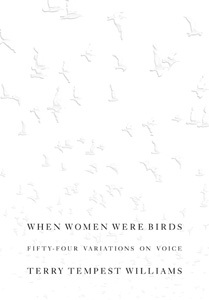 As Utah-born naturalist Terry Tempest Williams records the simultaneous tragedies of her mother's death of cancer and the flooding of the Bear River Migratory Bird Sanctuary, she creates a document of renewal and spiritual grace destined to become a classic in the literature of nature, women, and grieving. Disaster is at the center of this haunting book by Utah naturalist Williams (Pieces of White Shell, 1984), as the Great Salt Lake rises to break all records, submerging roads and driving the resident wildlife away, and as the author's mother dies of cancer at age 53. In the case of the lake, there's no one to blame except the developers who have so despoiled the wilderness that there's nowhere left for fugitive wildlife to go; in the case of Williams's mother, it's difficult not to blame the federal government. 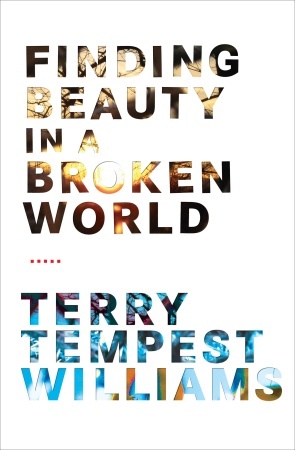 After her mother's death, Williams tells her father about a recurring dream of a blinding flash of light; he informs her that she actually saw it: an above-ground detonation of a bomb that she witnessed as a child while sitting on her pregnant mother's lap, innocent spectators trusting their government to protect their welfare. But, in fact, federal policy in the 50's dictated the confining of nuclear testing to a ``virtually uninhabited'' section of the country, considering that an adequate safeguard. Six aunts, a grandmother, the author's mother, countless neighbors in the Mormon community in which Williams was raised--all cancer victims- -were some of these ``virtual uninhabitants,'' Williams says. It is worth enduring the heartbreak of this intimately observed death in order to reach the author's culminating insight into the place where her only refuge from such grief lies. Williams's evocations of the austere beauty of the Utah desert, the Great Salt Lake, and their wildlife also offer great rewards. -- Copyright ©1991, Kirkus Associates, LP. All rights reserved. Composer Phillip Bimstein composed Refuge, a string quartet in four movements, based on Terry Tempest Williams’ readings from her book of the same name. It was composed for the Abramyan String Quartet. Excerpts from it can be heard by visiting this myspace page. You can also hear Refuge String Quartet, 2nd movement: "Silence" (on soundcloud). Passages from Refuge read by Terry Tempest Williams are available on CD, in collaboration with musicians David Darling and Nancy Rumbel, by Curve Blue. The Utah Rivers Council has done a lot of work to protect the Bear River from dams that would decimate bird habitat. April 29, 2002, feature article in High Country News entitled "The Great Salt Lake Mystery," by Tim Westby, about the ecosystem of the Great Salt Lake. May 1994 reading of Refuge, this article is about Terry Tempest Williams' visit to UC Davis. Article from The Salt Lake Tribune Sunday, April 25, 1999. Abramyan Plays Bimstein's Take on Tempest Williams by Catherine Reese Newton. The Abramyan String Quartet premieres composer Phillip Bimstein's interpretation of Terry Tempest Williams' Refuge. Excerpt Clan of One Breasted Women, epilogue to Refuge. 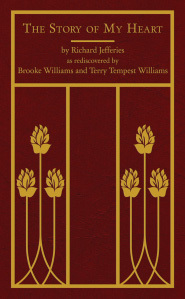 Clan of the One-Breasted Women was originally published in Northern Lights, January 1990, Volume VI, No. 1. Photos from Bear River by photographer Don Baccus. Nevada Test Site and also on wikipedia. Nuclear testing at the Nevada Test Site at the Brooking Institute. Common Marsh Birds of Northern Utah. 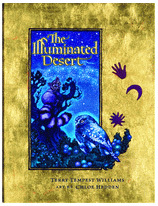 Note: See other Terry Tempest Williams' books in the Bibliography. © All materials copyright Terry Tempest Williams, 2001-2016, except as otherwise noted.